Watertown popcorn products, turned out by Pagel's Popcorn products, operated in connection with Pagel's Bakery, today came in for national publicity when the October issue of the National Candy Wholesaler magazine carried an article dealing with novelty products. The article is entitled ”Parade of Fall merchandise.“ The magazine is known as ”The Voice of the Jobber.“ It has national distribution among all important candy and confection houses and manufacturers. At an earlier time one could have enjoyed a potato chip junkie's treat: Pagel's Bakery cooked up a few chips every day and packaged them in a hand-stapled wax snack bag. One could buy a 25-cent bag of Pagel's not only at the bakery, but at the malt shop next door as well ! 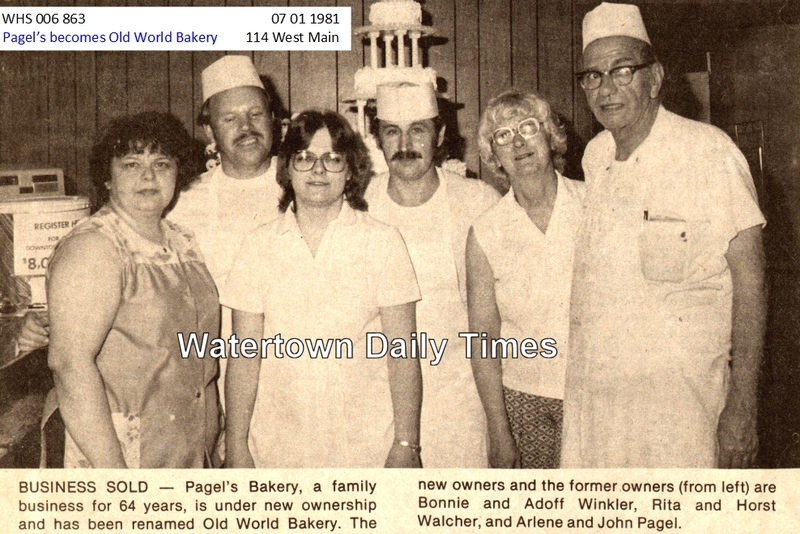 Pagel’s Bakery, a family operation for 64 years, has been sold and will be known as Old World Bakery. The new owners, Adolf and Bonnie Winkler and Horst and Rita Walcher, took over the business on Monday. The men were formerly employed by Hartter Bakery, 5513 West North Avenue, Milwaukee, Walcher as yeast dough supervisor and Winkler as pastry manager. Both learned their trade in their former countries. Walcher moved to the United States from Austria 10 years ago and Winkler lived in Canada for eight years before moving to the United States 14 years ago. Old World Bakery will specialize in wedding cakes, French pastry, whipped cream items, tortes, sour dough rye bread, and salt sticks, in addition to the Pagel’s bakery items. Hubert B. Pagel, father of John, started the bakery in 1917. John and his two brothers, Foster and Robert, took over the operation of the business in 1946 when their father became ill. They officially bought the bakery in 1950. John and his wife, Arlene, have been operating the business themselves since 1960.